Gorely (Russia). Seismic activity was above background levels 9-16 July, and gas-and-steam emissions rose from the crater most days. On 10 July, data suggested that the vent on the crater’s inner NE wall, above the level of the lake, had grown by 2-3 times the original size. The lake level had also fallen. Analysis of satellite imagery showed a thermal anomaly over the volcano on 8, 10, 12 and 14 July, and gas-and-steam plumes that drifted 25-150 km SE, E and S during 10 and 14-15 July. The Aviation Colour Code level remained at yellow. Soufrière Hills (Montserrat). Activity was at low levels during 9-16 July. An overflight on 15 July revealed no major changes to the lava dome, although there were some fresh rockfall and small pyroclastic-flow deposits at the head of the Gages valley to the W. The next day, heavy rainfall generated a few lahars in the Belham valley to the NW. The Hazard Level remained at 3. Ubinas (Peru). Buenos Aires VAAC reported, based on a pilot observation and analyses of satellite imagery, that on 18 July an ash plume from drifted NE. A subsequent report about 12 hours later stated that no further activity was seen. Batu Tara (Indonesia). Darwin VAAC reported that ash plumes rose to 1.5 km a.s.l. during 18-20 July and drifted more than 35 km NW. Fuego (Guatemala). Six explosions on 19 July produced ash plumes that rose to 4.4 km a.s.l. and drifted W and SW. Rumbling and ‘degassing’ sounds were associated with the explosions. Light ashfall was reported in Sangre de Cristo, 10 km WSW. The seismic network had recorded a total of 17 explosions within the previous 24 hours. Karymsky (Russia). Satellite imagery showed ash plumes drifting 30 km W and S on 7 and 8 July and a thermal anomaly over the volcano during 8-10 and 12 July. Seismic activity was above background levels during 12-14 July and suggested that possible ash plumes rose to 3.3 km a.s.l. Seismic data were not available other days during 9-16 July due to technical problems. Tokyo VAAC reported, based on satellite imagery, that on 19 July a possible eruption produced a plume that rose to 1.5 km a.s.l. and drifted SW. Ash was noted and then later dissipated. A possible eruption was reported the next day, and again a subsequent satellite image showed that ash had dissipated within a few hours. The Aviation Colour Code level remained at Orange. Kilauea (Hawaii, USA). Activity continued from the summit and the east rift zone during 14-20 July. At the summit the level of a lava-pool surface in the deep pit within the floor of Halema’uma’u crater remained mostly stable and glow from the vent was also visible at night. A plume from the vent mainly drifted SW. At the east rift zone two lava flows that broke out of the TEB lava-tube system advanced E through the coastal highway 130/137 intersection beginning on 17 July, and by 19 July were within 70 m of the nearest structure. A second set of active lava lobes were approximately 1 km to the NW and also advanced toward that general area. According to a news article, two people evacuated their home in Kalapana due to advancing lava flows. Kliuchevskoi (Russia). During 9-16 July seismic activity was above background levels. Satellite imagery analysis showed a large daily thermal anomaly over the volcano and a gas-and-ash plume that drifted 45 km NW on 14 July. Strombolian activity and gas-and-ash emissions were observed during 9, 12 and 14-15 July. Ash plumes occasionally rose to 6.8 km a.s.l. Tokyo VAAC reported a possible eruption on 17 July. Ash was seen in satellite imagery and then later dissipated. An eruption on 19 July and a possible eruption the next day produced plumes that rose to 5.2-5.5 km a.s.l. and drifted SW and SE. The Aviation Colour Code level remained at Orange. Nevado del Ruiz (Colombia). Washington VAAC reported that a plume at an altitude of 7 km a.s.l. from a possible eruption on 17 July was stated in a Bogota MWO SIGMET notice. A second VAAC report less than an hour later noted a brief seismic signal alert had been issued and that meteorological cloud cover prevented observations of the volcano. Ash was not seen in satellite imagery later that day nor were there any additional reports of activity. Pacaya (Guatemala). After an increase in activity on 13 July a decrease in seismicity was noted on 14 July. Strombolian explosions occurred on 14 July at 5-10 minute intervals and occasional small pyroclastic flows traveled S. Grey ash plumes rose 500 m and drifted WSW. Fumarolic plumes rose 100 m above MacKenney crater and drifted N on 19 July. The seismic network had recorded a total of 120 explosions within the previous 24 hours. On 20 July Strombolian explosions generated ash plumes that rose 100 m and drifted 2 km N.
Sakura-jima (Japan). Tokyo VAAC reported explosions on 14 and 20 July. During 15-18 July pilots observed ash plumes that rose to 1.8-3.4 km a.s.l. and drifted NE, N and NW. Plumes on 20 July rose as high as 2.1 km a.s.l. and drifted NW and N.
Santa María (Guatemala). During 19-20 July 16 explosions from the Santiaguito lava dome complex produced ash plumes that rose 300-900 m above Santiaguito and drifted SE and W. Ashfall was reported downwind in San José and La Quina. The seismic network had recorded a total of 24 explosions within the 48 hour period. Shiveluch (Russia). During 9-16 July seismic activity was above background levels and suggested that possible ash plumes rose to 4.3 km a.s.l. Satellite imagery showed a large daily thermal anomaly over the lava dome. Gas-and-steam plumes were seen rising to 3.7 km a.s.l. during 9 and 11-14 July. Based on analysis of satellite imagery, Tokyo VAAC reported a possible eruption on 19 July. Ash was seen in subsequent satellite images and then later dissipated. The Aviation Colour Code level remained at Orange. Suwanose-jima (Japan). Tokyo VAAC reported explosions on 17 and 19 July. Details of resulting plumes were not reported. Tungurahua (Ecuador). Bad weather prevented observations at times during 13-20 July. On 13 July incandescent blocks were seen rolling down the flanks at night and ashfall was reported in areas 8 km SW. Incandescence from the crater was seen the next night and ashfall was again reported in areas to the SW. During 15-18 July steam-and-ash plumes were observed and occasionally drifted SW. Ashfall was noted in areas within 8 km SW, W and NW. Lahars descended drainages to the SW, NW and N on 15 July. Rolling blocks on the flanks were seen after explosions on 18 July. 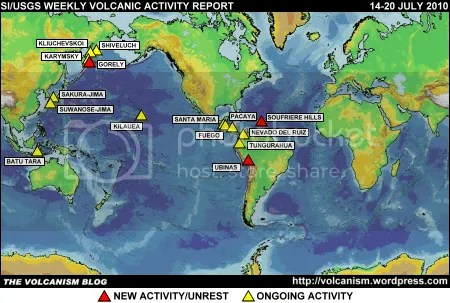 During 19-20 July steam plumes drifted NW and W.
The foregoing is a summary of the Smithsonian Institution/United States Geological Survey Weekly Volcanic Activity Report covering 14-20 July 2010. It is provided for information only, and is based on but not a substitute for the full report, which comes with its own criteria and disclaimers. The map base is derived from the Smithsonian Institution/USGS/US Naval Research Laboratory This Dynamic Planet website. It’s been kind of quiet over here lately, Ralph. Everything OK? Does anyone have any information on Chiaten? Is it still erupting like it has been for the past 2 years? 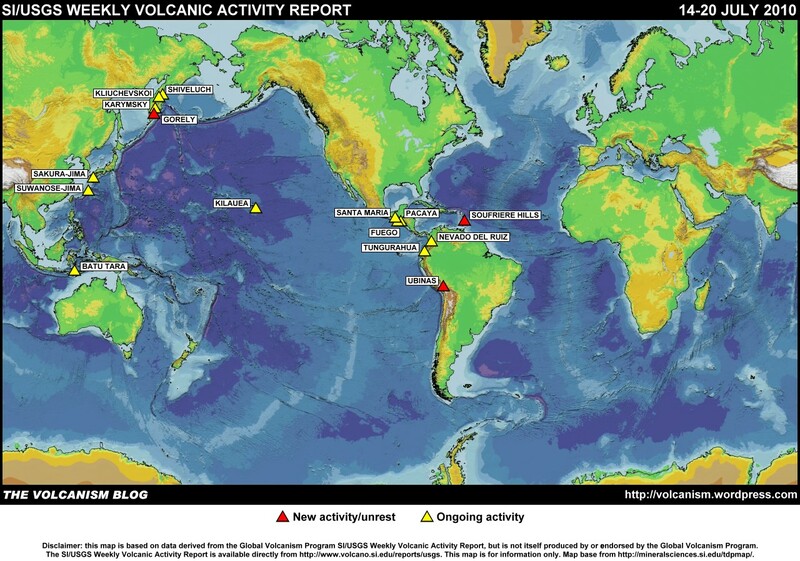 Here is the last report (it’s made with other volcanoes). You can read it in the OVDAS page, Región de los Lagos report.